Located on the shores of beautiful Hilo Bay, this hotel affords breathtaking views of the Mauna Kea, the lush Hamakua coastline and tranquil Hilo Bay. As the gateway to Hawaii Volcanoes National Park, Grand Naniloa Resort, A DoubleTree by Hilton provides the perfect base for visitors to explore the many natural wonders. Unwind in any of the 388 guest rooms and 19 suites, featuring Wi-Fi, a large screen TV and optional ocean views. Tee off on the 9-hole golf course, energize at the modern fitness center, or soak up the sunshine in the beautiful outdoor swimming pool. 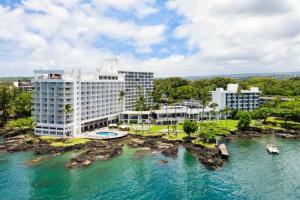 Located near downtown Hilo and Hilo Airport, approximately 28 miles away from the Hawaii Volcanoes National Park.